Hi guys, winter has arrived here! Just how do I know? Well... I've been chasing panels from my greenhouse all around the garden and I feel a bit like Piglet in Winnie the pooh and the blustery day and I've a feeling this is just the start! Last week, some of my wee Carer group (Three Towns Carers), were missing in action. I think this time of year brings added stress and struggle for Carers, everything seems just that bit more difficult in the grey days of winter and I honestly think, grey days make for greyer moods and with coughs and sneezes all around, it's so hard to avoid the dreaded sniffles! While a cold is a pain in the neck for most people this time of year. For most Carers it means, addition struggles coping in an already leaky boat and a dread they'll be ill themselves! Speaking of which...NHS, Carers and Flu Jabs! All being well, we're off for our flu-jabs this Saturday. Remember Carers get free flu-jabs too - see you're Doctor now! Don't just get a flu-jab for the person you look after but...get one for you too! 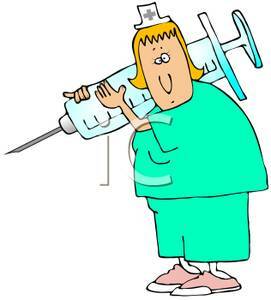 Trust me, the flu jab isn't really as big as this one! lol You won't feel a thing - well, not really! Am I slowing down for winter? Heck no! I've a SIB (Shadow Integration Board for Health and Social Care) meeting on Thursday in Irvine and the Carers Scotland Summit in Stirling on Friday - I like to keep busy and I'm so grateful for the SDS (Self Directed Support) that makes it possible for me to stay actively involved with things that are so important to me! Well, it's definitely 'woolly hat and wellie wearing weather'! so...keep strong,keep cosy and splash in a puddle too - it's good for you!